Developed by XJTAG®, the software for OrCAD® Capture will significantly increase the Design for Test and Debug capabilities of the schematic capture and PCB design system. Engineers now need to be able to determine at the schematic stage how they can best implement Flash programming, JTAG debugging and boundary scan testing. With OrCAD Capture, users now have access to XJTAG DFT Assistant to help check that JTAG chains on the board are setup correctly and ready to support testing, debugging and programming. By eliminating errors and helping ensure the JTAG chain is used to its full potential, DFT Assistant helps boost test coverage and ensures that prototype boards can be tested and programmed with boundary scan as soon as they are received back from assembly. We need to determine early in the design phase how to maximize test coverage using the minimum number of test points. So it is vital to know what JTAG access is available at the schematic stage. The XJTAG DFT Assistant for OrCAD Capture makes it easy for us to see the test coverage as the design evolves and this allows us to optimize our testing before the PCB is produced. 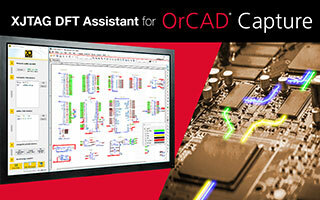 OrCAD® Capture has a multitude of features that help engineers manage their PCB designs efficiently, from initial schematic entry through design analysis and rule checking, layout optimisation, component selection and BOM management. Tools such as automated wiring accelerate laborious processes, viewers with colour coding help inspect nets and navigate connection hierarchies, and database and search tools help streamline component selection.